Ludwig & Ludwig 14 x 27 ‘Genuine Stipelgold’ Bass DrumThe lowest pitched drum in a marching band or with a drum set. 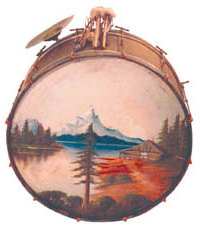 A two-headed drum, it is usually... decorated with ‘Cabin Scene’ painting. A cymbalA copper/bronze (or variation of metal alloy) disk struck with a drumstick or crashed together ... is attached to the wood rimThe metal hoop that keeps the drumhead in place. It fastens down onto the drumhead by screws (o... of the drumA hollow cylindrical shell of any size that has a head stretched over one or both ends and is b..., as is a wire malletA type of drumstick used to strike a percussion instrument. The shaft of the mallet is often ma... holder with sticks and mallets inserted. 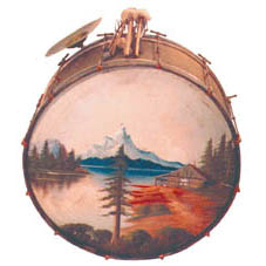 This bass drum was the centerpiece of the trap set used during the twenties and thirties by Jack O’Grady’s Varsity Entertainers in Terre Haute, Indiana. John J. ‘Jack’ O’Grady was both the drummer and leader of the band/orchestra. Typical of bass drums from that time period, this 14 x 27 single-tension drum with calfskin heads was manufactured by Ludwig & Ludwig. It is finished in ‘Genuine Stipelgold,’ which was introduced in 1926, then renamed ‘Ludwigold’ around 1929. Stipelgold shells had a gold-flake, stucco finish, and most drums also had ‘De Luxe’ gold-plated tension rods and posts. Also typical of the era is the painted scene on the front drumheadThe covering or membrane, made of animal skin or synthetic plastics, that stretches over the dr.... Many scenes were available from Ludwig and other companies, the most popular being landscapes representing the seasons. An electric light inside the bass drum illuminated the scene and helped reduce humidity in the calfskin heads. Included with this set are two cymbals: a 9 3/4-inch Zenjian (sold by Ludwig) and a 7-inch, unmarked cymbal. 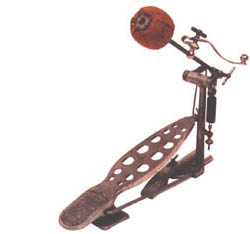 The smaller cymbal was mounted vertically in order to be struck by a small beaterA drumstick, usually with a mallet-type head, that beats the drum. attached to the bass drum pedalThe pedal used to play the bass drum on a drum set. . O’Grady’s bass drum pedal is an improved version of the original 1909 Ludwig drum pedal and bears the date 7/15/24.